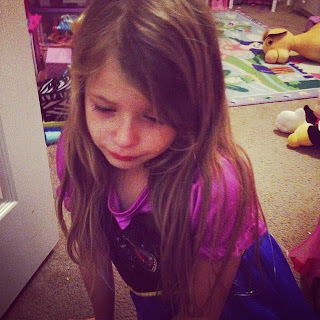 Airing My Laundry, One Post At A Time...: 4 Ways My Daughter Has Made Me Go "WTF?" 4 Ways My Daughter Has Made Me Go "WTF?" Having a daughter is fun. You get to dress her up. You get to have a shopping buddy. You also scratch your head a lot because you don't understand her behaviors. Here are some things that have left me going, "WTF?" when dealing with my daughter. "I couldn't leave it! It was lonely! It needs to live here. With us." She was serious, guys. I refused to let it in the house but it still sits outside our front door. 2. I heard her crying in her room the other night. I thought she was hurt so I rushed upstairs. "I miss my tooth being in my mouth! It used to be there and now it's GONE! It's GONE, Mommy!" She had finally lost her first tooth and she was freaking out about it. 3. She'll be playing nicely outside and then she'll come to the door with a friend. This always seems to happen when I'm on my period with unbrushed hair, a stained shirt, and sweatpants. "Can my friend come inside? We're bored." I'll explain that I look awful and she'll say, "We don't want to play with YOU." Still. I don't want to traumatize someone else's child. Why can't she want to invite someone in when I look decent and smell like a peach? 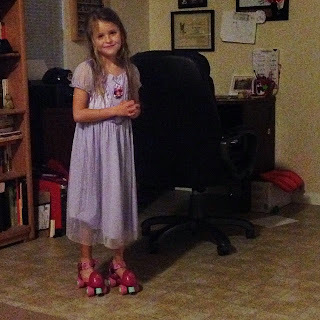 "Why are you getting rid of my skates? You know how much these mean to me!" Even though she has NEW skates. This is why I have to get rid of her stuff while she's at school. Otherwise she'll suddenly discover that she NEEDS her Little People castle in her life. Hahahahah! This has me cracking up. 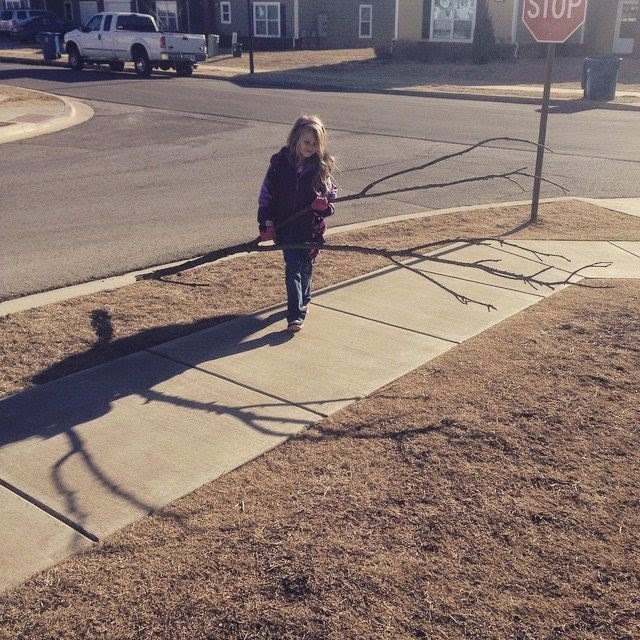 I think the tree branch one sounds like something I would have done at her age. Unluckily for my mom, I was always the kid to just have random animals follow me home... and then I'd beg to keep them! This made me laugh out loud. I've been absent from the blog world for a bit.. but I'm back and wow! the kids have grown! HAHA I love reading about her and her personality. Erica does the same thing with toys and clothes. BUT I LOVE IT, is what she screams at me through tears. Kids are weird. I think all kids are like this in some ways. My youngest will cry if we look at her the wrong way. Or if she doesn't have the water bottle she wants in her room. She also will carry around objects that make no sense. It's impossible to clean out the basement when my boys are around. Suddenly the toy they never look at is valuable and important. My kids will justify every single last piece of trash in their room. It makes me crazy!! Why do we need to say this piece of fuzz!??!?! ALL OF THIS. K will do and say the weirdest things. she has a crush on this boy named Julien and the other day when she came downstairs for breakfast, she says "i had a dream about julien and when i woke up, i had hearts in my eyes" (like the emoticon) LOLOLOLOLOL. HaHa - I love the way Natalie's mind works!!! When the boys were younger getting rid of toys was brutal. Then last summer they decided to get rid of ALL the old toys and I was the one who didn't really want to! Omg that branch. That's so funny she wanted to bring it home. Then again, I used to bring home sticks, rocks and leaves. haha these were hilarious especially the tooth!! So cute! Hahahaha! Oh geez... I just can't wait for this stage. Said with heavy sarcasm. Lol. Your daughter reminds me so much of my niece, who is 11 now. My sister has to stealthily clean out her room when she isn't home, but it can't look TOO clean or she'll notice, and lament the piece of paper that my sister threw away! Haha! The stick was lonely. She sounds adorable and very kind hearted! ha! That sounds like a hearty mix of Des and Scarlet. Des would certainly bring an entire tree home. I love the tree branch thing! She is very sweet! Ha, so random with the branch. My girls are still just babies but I do experience your number 3 with the fedex and ups guys. They seem to only deliver my packages when I look like crap, lol. Seriously, girls are a complete mystery!